Early in my time in Peterborough, I said something that got some pushback. While I can’t remember verbatim details, I certainly remember the gist of it. My words implied that we need to improve/to get better. Those who pushed back felt I was implying that they weren’t good enough just as they are. They wanted to be seen as whole, just as they are. So what does it mean to be whole? Wholeness, in the midst of life’s changes and transitions, cannot be seen as a process of returning to some original perfect state. Rather, we are always working with the whole of what we are to make something new. Our pieces do not need to be put perfectly together, but are more like building blocks to be molded into a yet-to-be-imagined form. To be made whole is to be all of what we are…in whatever assemblage is true at the moment. But when we do feel broken, and wholeness seems illusive, remember that cracks make room for creativity. That’s not to minimize the pain, or to scorn our wish for improvement. Rather, seeing what’s broken calls for us to perceive our lives as filled with possibility. “Look closer,” says our faith, “that ash, if worked with, can give birth to a Phoenix.” “Your broken pieces are more than rubble” is something our faith tells us about wholeness, urging us to “Crack wider!” As odd as it sounds, we become more when we are broken open. To be honest, I fear that I DO sometimes lean too heavily on ‘improvement’ over ‘acceptance.’ It’s in my DNA. But we do well to remember the word AND. We are broken AND we are whole. In fact, our brokenness, along with our ability to improve, repair and restore ourselves, is what makes us perfectly whole just as we are. Wholeness is not about perfect health or right behaviour. It’s not about never making mistakes, or always feeling confident. 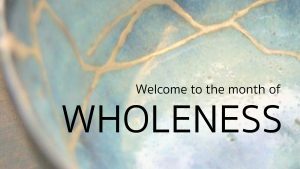 Wholeness as human beings is about embracing the whole of what it means to be human…which is to be constantly learning, constantly slipping up, constantly dreaming, constantly opening ourselves to the new. It’s experiencing the full range of what it means to be alive…wholly human. You are whole and you are holy…just as you are. 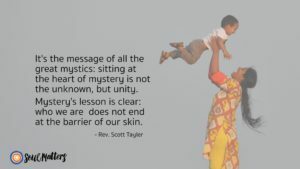 Unitarians love to tell journey stories. And hear each other’s journey stories. It’s a curious thing when you think about it. We welcome people to our community not by asking them to commit to thinking exactly as the group does, but by having them speak to how their journey is unique. 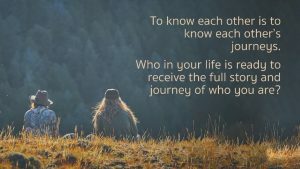 We connect to each other not by sharing the same journey, but by offering each person the space to discover the unique journey that best fits them. It’s about making room for people to write their own stories. Or maybe it’s about making room for people to re-write their stories. It’s become popular in our society to talk about spiritual journeys as a process of living into your full or true self. That’s a helpful frame. And yet our spiritual journeys do not begin with a blank slate; they often begin with a need to untangle ourselves from the identities we were given but which don’t fit, and to begin anew. So then, most spiritual journeys begin with a leaving, a separation, or a decision to walk away, the first steps are often laced with mourning and isolation. “Unbecoming” is not easy work. And, this isn’t just a one-time thing. We find ourselves routinely tangled up in all kinds of identities and journeys that aren’t truly ours. “Unbecoming who you are not” is a journey we walk nearly every day. So, being a community of journey involves tenderness. Making room for each other’s unique stories includes making room for each other’s pain. Remember that “unbecoming who you are not” can involve isolation and mourning. Perhaps pit-stops of kindness and tenderness along our way will be just what we need to boldly continue our journeys of becoming. So what does all this mean for us this month? Well, first, it’s an important reminder that along with being here to help each other hold steady and persevere on our paths, whether it’s a path of becoming or unbecoming. One thing is for sure; we are blessed to have each other’s company as we travel this journey of life. Can you just be a bit more clear? I need some clarity! Not long ago, I got my first pair of progressive-lens glasses. Before these, I had glasses for distance, and I would wear them only at movies or when driving at night. But, while my eyesight is still pretty good, I find that I more often need reading glasses, and that reading anything is especially problematic when I have my distance glasses on. Switching between two pairs of glasses is difficult, so, I tried (am trying) progressives. The hardest part is that they make me dizzy. Because the distance the glasses are meant to make clear is not consistent throughout the lens, my brain doesn’t seem to be able to keep up. I move my eyes, and what I see gets blurry. I move my head only (which is what the optometrist suggests) and I can’t find the point of clarity. I’ve been told that if I just wear the glasses more, I can train my brain to adjust. But I don’t like being dizzy. Isn’t this what modern life is like? We all used to have single lens vision…we only needed to understand things from our own culture, people who were ‘like’ us, and places that were already familiar. And now, we constantly must wear these crazy ‘progressive’ lenses…being called to shift foci, straddle cultures and broaden our comfort zones. No wonder things can feel so unclear. Here’s another analogy that might be helpful. When a ballet dancer is doing turns, they use a technique called ‘spotting’ to keep their gaze on a single location, a fixed spot. This helps to prevent dizziness and enables them to spin for an extended time. 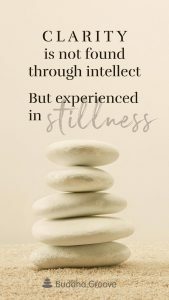 I find myself thinking that because we need to become more accustomed to things being blurry and constantly changing, we also need to find and trust points of clarity and stillness that will bring us back to ourselves. What matters most to us? What are our highest values? In what direction are we headed? Who or what do we love? “Before I can tell my life what I want to do with it, I must listen to my life telling me who I am,” Parker Palmer writes in Let Your Life Speak. In order to know how and where to turn in our spinning world, we need to find an inner sense of clarity and purpose. And this takes training, helping our brains to adjust to new and fast-coming information. Perhaps more importantly, it can train our spirits and our hearts to trust. What are you clear about? Can you find the ‘spot’ that will keep you balanced? This month let’s explore how clarity might help us to find ourselves right at home in the most blurry of circumstances. Is perseverance a virtue? Often, we hear advice that makes it sound that way: Buck up! Grin and bear it! Keep pushing! Keep moving forward! Dig deep; you are stronger than you know! But maybe Koyczan is right. Maybe this advice isn’t the path to perseverance; maybe it’s just the path to breakdown. And yet, our lived experience tells us that we can’t just give up when we fall down, or hit a wall, or are simply too tired to go on. Life calls us on. There is something about getting up and trying again that serves us well, especially if we are in pursuit of something meaningful. So which is it? Is perseverance a path to breakdown, or a path to breakthrough? Maybe it’s both. Maybe if we persevere by trying to go it alone, without taking a break or stopping to get a breath, it leads to breakdown. And, maybe if we find ways to persevere even after falling down or hearing one hundred no’s or after ‘breaking our vows a thousand times’, we will eventually succeed. Constantly pushing ourselves without also giving ourselves the gift of pause gets us nowhere. Digging deeper without making time to fill our wells is a recipe for self-inflicted pain. And maybe admitting we can’t do it alone and asking for help is the real strength that gets us through. Let’s do it together, okay? Let’s ask one another for help. Unitarian Universalists tend to love questions and questioning. We love wondering and trying to figure out life’s mysteries. Sort of like a puzzle to solve. But what if mystery isn’t something to figure out? What if it’s something to be felt and listened to, but not solved? Being a community of mystery isn’t just about engaging life as a marvelous puzzle. It’s also about allowing ourselves to be spoken to by life and its wonders. Perhaps then we’ll notice that life isn’t simply trying to stump us with mysteries. Rather, life uses mystery to connect with us, one with all-that-is. During this holiday season, may we each find moments during which we can dwell in mystery, and in so doing, to find our place in the oneness of everything.